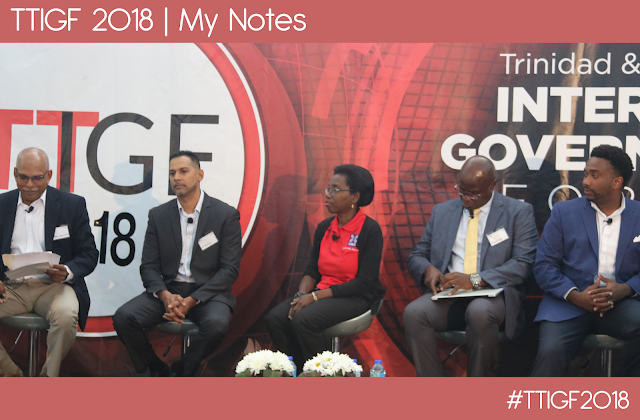 Here are my takeaway notes (sometimes paraphrased) and what I got out of the conversations and speeches from the event which I shared on twitter under the hashtag #TTIGF2018. Contact TTIGF/TTMAG if you would like to get involved in the work they do. The stream was recorded and should be on their YouTube and Facebook. The organisers did a good job including a stream that worked mostly well and they are easy to engage with online. Also share your thoughts with me in the comments below. Persons were urged to complete the survey and feedback form that will be circulated post event. The empowering benefits of the internet but there are challenges like the chunk of persons still without internet access. Trinidad and Tobago is very active in the CTO (Commonwealth Telecommunications Organisation) and supportive of their agenda. How blockchain and other digital developments can be used to tackle the problem of the unbanked. Internet Governance Forum is multi-stakeholder, bottom up and open in tackling issues and finding solutions. I appreciate what is being done locally like WiPAY but I also want to see support for the global options like PayPal and Samsung Pay. Lack of widespread info on ecommerce options and what needs to happen locally (plug for the importance of tech bloggers). Education and about safeguards key to getting public buy in for digital payment solutions. LINX not an ecommerce payment gateway because it is not seen as a (main) strategy point for the banks (at this point) and would also require agreement from all banks (the owners of LINX). Businesses. Web development and ecommerce should be seen as business development and an investment. Prioritize it in your budgeting. Citizen lobby is key to changing things and social media and tech tools can drive this. Online is not disconnected from offline and our cultural traits would apply to online behaviors. Social media is empowering because of how accessible it is especially compared to traditional media but should be used responsibly. We have to be careful about the vanity of social media and the ridiculousness. We can steer the conversation and be solution oriented. Blockchain has the potential to change how things are done and this is across industries. We need to delink the concepts of blockchain and bitcoin. Blockchain can be used otherwise. Blockchain for solutions for areas like the unbanked and referendums and transparency. Is there chance of monetary union in the Caribbean and where is blockchain in that picture? How do we overcome the hesitation by country decision makers to fix things and use tech in that regard? Internet Governance Forum aims to be open, inclusive, transparent, bottom up and non-commercial (not to be confused with donations and support with no strings attached). Tricky question. Should the government have some control of our internet access in Trinidad for whatever reasons especially sovereign issues? (Personal feeling - I would say no and that the openness of the internet is very valuable). What happens after this forum? This will probably be a key feature of the next TTIGF and a reminder that this has only been the 2nd such forum in Trinidad. Suggestion was made for an internet hall of fame for Trinidad (*ahem* Section for tech bloggers please).